Organize, search, and manage your information with askSam. askSam is a flexible and powerful way to organize information and create searchable databases from Web pages, Email, PDF files, texts, and Word documents. askSam is the only database designed for both structured and unstructured information. See how easy a database can be - no programming, no complicated query language. askSam puts your information where it belongs... at your fingertips. GATHER INFORMATION FROM ANYWHERE askSam lets you enter, save, and import information from a variety of sources: * Save Web pages from your browser into askSam. * Import - Microsoft Word - Word Perfect - PDF - Text - HTML - Excel - Microsoft Access - ODBC Databases * Import Email from Outlook, Eudora, Netscape, and Pocomail. INSTANTLY SEARCH Once your information is in askSam, you're ready to search. Not only can you search on the contents of fields, but you can search the full-text. askSam offers a wider variety of searches than any other database program and some of the fastest and most powerful searches you'll find anywhere. ORGANIZE YOUR INFORMATION askSam offers a completely new way for you to organize and navigate your information. With the Dynamic Folder View, askSam lets you place information in folders and sub-folders. Unlike most folder implementations, askSam Folders are displayed dynamically. You select a field in your database, and askSam builds the Folder View based on the contents of this field. 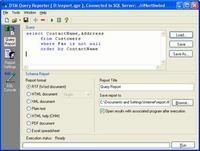 CREATE YOUR OWN REPORTS No programming is necessary to create great looking reports. Simply use askSam's built in Report Writer to drag and drop field names to the desired position on the screen. askSam gives you the power of a database without the complexity. Whether you're trying to organize research, archive email, or create searchable databases, askSam provides a powerful, but simple solution.